This page is to help you get your Affiliate tracking links for email campaigns and Banners ads to place on your web page. To do this you simply open up the United States Referral™ homepage. Go to the bottom of the page and click on the Affiliate Information link, and complete the form. This process will take about a minute. 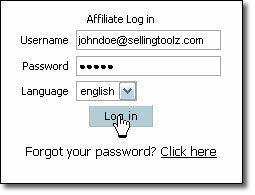 You will be emailed a password that will allow you enter the Affiliate Resource Center. Now that you have your Affiliate password, go to the United States Referral™ homepage, and at the bottom of the page click on the Affiliate Login link. You will be brought to the login page. Enter your email address, and the password you were emailed in the previous step. You will be at the SellingToolz Ltd. Affiliate Resource Center. On the left side of this page click on Banners/Links. There will be several links and Banners to choose from, all of these will be your personal tracking tools, these will ensure that you are credited for the people that you send to our sites. In many cases the most used Media type, is the text link that you will use in your email that will send people directly to the United States Referral™ homepage. To get your text link, click the link marked Show banner code below and to the right of the text link. Click once inside the box, this should select the entire link. Right click on the link and choose Copy, then once in your email, right click in a blank area and choose Paste. Note: Do NOT use the example links shown in this tutorial, you will NOT be credited for the people you send to our sites. Once you have copied this link and pasted it into your email you are ready to start sending links and being tracked. You can even place this link in your email signature if you have one. The next Media type is a United States Referral™ Banner or Button that you can have placed on your website. To do this you simply copy the code, paste it in an email and send it to your Web Master. Click once inside the code box and it should select (highlight) the code. Then right click and choose Copy. Then, once inside your email, right click in a blank area and choose Paste. You will also see banners for SellingToolz Ltd., as well as Canada Referral™, again you can copy and paste these codes and email this to your Web Master if you choose to have these banners placed on your site. If you are not comfortable with the copy and paste technique, you could give your Web Master your email and password for the Resource Center and a link to the Resource Center and have them access this information directly.